What happens when you watch one of your favorit show and hear an epic quote like this ? Of course you want to picture it. Then you realize that you got your son a Lego set with everything you need . Then you take the picture. First, the show is The Big Bang Theory. What, you never watched the Big Bang Theory ? Well then, just get the The Complete First Season for a start. This is a great sitcom about a group of 4 geeky and socially awkward friends and their neighbor, a waitress and aspiring actress with less intellectual skills but far better social skills and common sense. Well, that was in the first season, since then they socialized a little (one even got married…). Bernadette: Well, what if Hulk picked up Thor while Thor is holding the hammer? 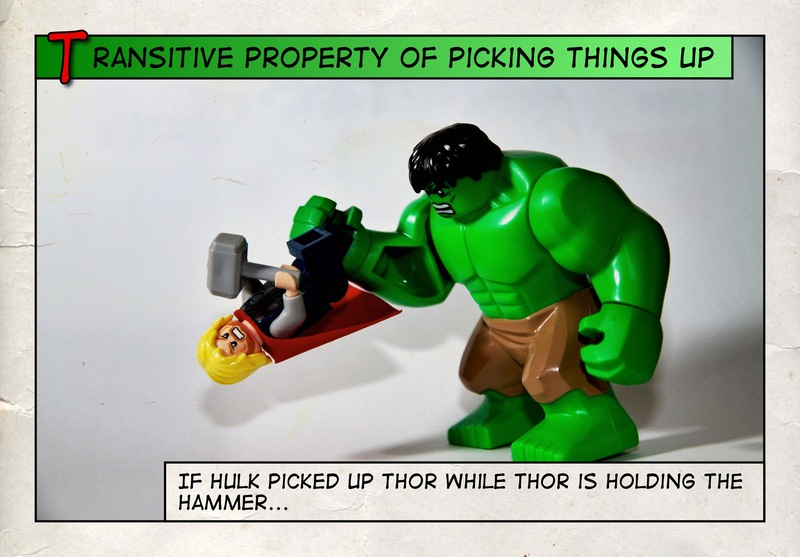 Bernadette: Then by the transitive property of picking things up Hulk picked up the hammer. As I wanted to illustrate the quote, the picture must focus on the idea: Hulk picking up Thor as Thor holds the Hammer. I didn’t wanted other things to interfere, so I choose a simple white background. With real people, you take this photo in a studio with a background. With toys, you use a lightbox. But I didn’t have one, this is just a piece of white paper. I used two flash to have 2 light sources. As this illustrate a quote, I couldn’t just post the picture. I had to add the quote. And as this does illustrate Comic books characters, what about turning it into a cartoon ? To do so, I used the app Halftone. Yes, the image was partially processed on an iPad. At the end, I have a picture which is either a photo and a cartoon. For this picture, my actors are toys. Soon, I’ll publish a post about toy photography, but I can say that Toys are great to express some creativity. I can’t afford a model dressed up in Hulk and another in Thor. But I can… borrow my kid’s Hulk and Thor toys. There is another challenge then: trying to get some emotion from those inanimate objects. The advantage is that you have all the time you want to take your picture. Can you imagine, as an actor, being hold like this for minutes or hours ? This entry was posted in Photography and tagged Big Bang Theory, Cartoon, Comic, Hulk, Lego, Thor, Toy Photography on May 17, 2013 by Darko Stankovski.